Automatized Surface Functionalization for Diagnostic Systems. Pumping system controlled by a microcontroller connected to the microfluidic chip is shown. Congratulations to Ali Aljuraidan (Crown), Aditya Gumparthi (Crown) , Eduardo Hirata (Crown) !! for winning Dean’s Undergraduate Research Award!! Project Description: Microfluidics has enabled the development of a cost effective, miniaturized, and fast diagnosis tool used to detect and determine a patient’s condition by using body fluids (e.g. blood, saliva, sweat, urine). Such lab-on-a-chip microfluidic devices have provided a platform for point of care (POC) diagnostic devices. One method to analyze the large variety of biomolecules present in sample fluids is by active techniques like surface acoustic waves (SAW), which can be utilized for a wide range of applications including immunoassays, size-based cell separation, flow cytometry, and bead-based assays. Current diagnostic systems require trained personnel, expensive equipment, and a large area, making them infeasible. 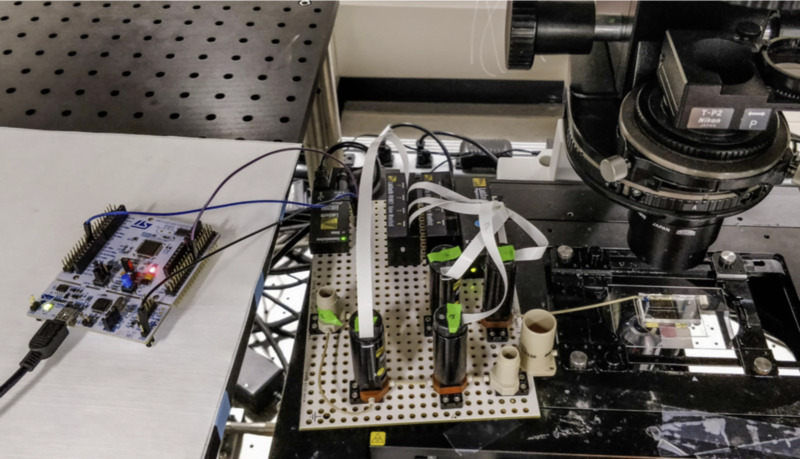 Our project solves the multi-level problem through automation and miniaturization of components responsible of functionalizing a microfluidic chip. This is done by providing a unified platform capable of functionalization and surface acoustic wave (SAW) particle separation. The platform is capable of completely autonomous operation and requires very little training to operate attributed by its user-friendly interface. Future Plan: Further work would involve taking this prototype to the manufacturing phase. That would require the platform to pass tests such as EMI and EMC. The portability and form factor of the platform could be further improved upon by DFM practices. In addition, development of a portable optical system is required to substitute the microscope. Such additions will complicate the design and may increase the cost but will result in a completed POC diagnostic device.